On November 8, 2018 CommScope, global leader in infrastructure solutions for communications networks, announced the acquisition of modems and set-top boxes maker, ARRIS International Plc. for $7.4 billion in an all-cash transaction that includes the repayment of debt. This acquisition creates a significantly stronger player in the telecom networking equipment sector and it will put the combined company in a good position for the upcoming 5G roll-out. Additionally, The Carlyle Group, an American private equity firm, will take part in the transaction as a minority equity investor of CommScope with $1bn in financing to help the transaction. CommScope, founded in 1976 and headquartered in Hickory, North Carolina, produces communications equipment and sells connectivity products to the wireless industry and cable operators. CommScope was influential in the creation of innovations like the cable TV infrastructure, the first wireless network, the first data centers or the first intelligent buildings. With a team of 20,000 employees the company operates more than 30 manufacturing and distribution facilities and owns around 10,000 patents. For the year 2017 the sales amounted to a value of $4.6 billion and the operating income to a value of $478 million. While the operating income increased by 217% from year 2015 to 2016 (mainly due to an increase of revenues by 30% and only an unproportioned increase of costs). The following year, the operating income showed a negative trend, as did the revenues. In 1997 CommScope went public for the first time after changing ownership several times. In January 2011, private equity firm Carlyle Group took the company private in a deal valued at $3.9 billion, including debt. In October 2013 CommScope was taken public again by the Carlyle Group and raised $576.9 million when trading kicked off reaching an equity valuation of $2.7bn. Carlyle was holding a 75% stake in CommScope after the offering (subject to the fact that underwriters could exercise their option to purchase additional shares). ARRIS International, founded in 1969 and headquartered in Suwanee, Georgia, is a media entertainment and data communications solutions provider. ARRIS International plc, formerly known as ARRIS Group Inc, changed its name in January 2016. The Company operates in three segments: Customer Premises Equipment which generates 58% of revenues, Network & Cloud and Enterprise Networks with 33% and 9%, respectively. The Enterprise Network is operated by the recently acquired Ruckus Wireless and ICX Switch businesses. With around 8,700 employees, ARRIS is directly and indirectly present in 73 countries and owns more than 5,000 approved or pending patents. In the year 2017 ARRIS generated revenues of around $6.6 billion and an operating income of $123 million. After the company experienced a decline in the operating income from 2015 to 2016 year of 48%, in 2017 the figure increased by 11%. However, the revenues were showing an opposite trend, while revenues increased for 2016 by 42%, they declined by 3% in 2017. Expected to hit the $3tn value by 2020, the telecommunication industry as a whole is nowadays subject to structural pressures, which are threatening its profitability. Deloitte tagged 2018 as “The Year of Invisible Innovation”, involving some major changes, making the lines between the telecommunication companies and the technology vendors increasingly blurred. A very quick Porter’s Five Forces Model application, which is provided hereafter, will help in finding out something more about the telecommunication equipment industry. First, as far as the threat of new entrants is concerned, the huge barriers to enter this environment make it very difficult for potential new players to step in. Indeed, the industry is notoriously highly capital intensive and not particularly lucrative. The suppliers are mainly providers of specific equipment and components, therefore they should be fairly powerful, but the large number of vendors on the marketplace sensibly dilute their bargaining power. Conversely, the power of buyers, in large part huge companies such as AT&T of Verizon, has been rising over time because of consolidation in that industry. Another important aspect is that commoditization of internet services significantly lowers prices at the end-user’s level, therefore those giants try to cut costs as much as possible by putting pressures on companies such as CommScope and ARRIS further decreasing their margins and sparking a consolidation also in this industry. The competitive rivalry represents a major source of worry for the sector. Competition is fierce and driven by prices as the products are increasingly commoditized. On the top of that, the high exit barriers of the industry make potential liquidations very difficult, while the depreciation connected with that specialized and quickly obsolescent equipment is rather heavy on firms’ income statement. Overall there are not many substitutes at the moment, as the internet service is provided mostly through cable lines and the cellular grid and this companies tend to do business offering solutions using both mediums. But additional pressure is now coming from a structural wave of innovation hitting the system: the advent of the 5G era. Expected to be the underlying connective tissue for the Internet of Things, autonomous vehicles and much more, the 5G revolution represents a demanding source of investments and capital expenditures for the companies involved, concerning broadband, rural coverage and wireless densification, obviously to the benefit of the equipment suppliers that will be able to ride it. Having all these concepts in mind, it is straightforward to infer that the telecommunication system is nowadays in need for a restructuring. A promising choice is hence represented by M&A opportunities, so to leverage on one another’s strengths and survive the changes of the industry and the cut throat competition. Having said this, from a worldwide perspective, the fastest-growing market in this industry is the Chinese one, massively exporting equipment all throughout the globe. Anyway, the recent disclosures by the President Donald Trump concerning trading tariffs are casting some doubts about the feasibility of the predicted results and growth of the sector. It is estimated that a total of $24bn worth telecommunication equipment will be subject to the next round of tariffs. The impact of the incoming decisions will definitely further strengthen the race between the US and China, currently fighting for the 5G dominance. This race had already proved to be rather intense, when the President Donald Trump blocked a bid by Singapore telecom provider Broadcom, which was about to buy San Diego-based Qualcomm, back in March. However, what the US President’s administration is now claimed for is the potential negative outcome that these trade deals might involve, in terms of costs for infrastructure producers, importing from China. “These latest duties threaten to raise the cost of 5G infrastructure in the U.S. by hundreds of millions of dollars,” Nokia officials told the F.C.C., according to public filings. The $7.4bn deal (Enterprise Value) has been structured as an all-cash transaction. The two parties have settled down on a price of $31.75 per share, representing a 27% premium to the volume-weighted average closing price of ARRIS’ common stock for the 30 trading days preceding October 23rd, which was close to $25. However, this price has recently been legally contested by Brodsky & Smith LLC, representing ARRIS’ shareholders’ interests. As a matter of fact, they have started an investigation against ARRIS’ board of directors, claiming its members have betrayed the fiduciary duty they had towards shareholders. More in detail, what Brodsky & Smith LLC is trying to demonstrate in this litigation is the fact that the arranged price underestimates the value of the target company. The ground for this claim is to be found in some analysts’ different valuations of the shares at issue, fixing their price at $39 (implying an EV of $8.7bn). The discussion is still ongoing, but a deviation from the original deal seems rather unfeasible. CommScope has declared it will resort to a combination of cash on hand, alongside some borrowings under already existing credit facilities, plus $6.3bn incremental debt, extended by JP Morgan Securities LLC, BofA Merrill Lynch and Deutsche Bank Securities Inc. Additionally, a fourth major source of financing for the transaction is expected to come from The Carlyle Group, which used to be a former CommScope’s owner. This said, the private equity firm will provide the acquirer with additional $1bn, in the form of a minority equity investment, so to step once again into the company’s shareholding, being entitled to 16% ownership, and adding two representatives to the board of directors of the combined entity. In the aftermath of the transaction, CommScope’s president Eddie Edwards will keep on being the president and the CEO of the combined entity, with the current acquirer’s board of directors controlling both the two firms. CommScope’s acquisition of ARRIS is framed within the context of two industries with a slowing top line: network gear for phone and for cable. In order to face this challenge, the two companies have decided to combine efforts and expand into new horizons, especially into the 5G wireless technology. Indeed, CommScope was under considerable pressure to seek a change of scenery due to the big network-equipment customers’ trend of shifting strategies towards media acquisition, for instance the recent acquisition of Sky by Comcast for $38.8bn, and the importance of generously investing in R&D to develop the 5G technology. The acquisition of ARRIS enables CommScope to unlock high-growth segments of the market that the company expects that will more than double its total product addressable market to around $60bn. Indeed, the two companies will share technical expertise with 15,000 patents, an $800mm annual budget for R&D and a global footprint by serving customers across more than 150 countries. The deal comes at a time where the industry is in the midst of a race to bring the 5G technology to customers and hence the largest players are spending billions of dollars in Research and Development. With the acquisition of ARRIS, CommScope pursues an expansion of the product offerings as well as an increase in the R&D on account of cost saving opportunities and synergies. 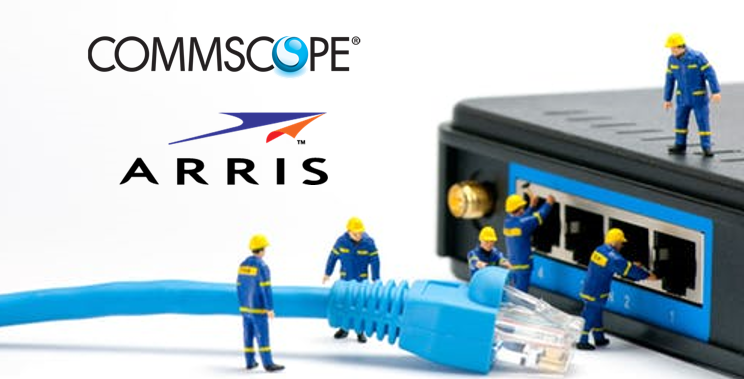 As claimed in CommScope shareholders’ statement regarding the acquisition of ARRIS, the company expects a cost saving of at least $150mn within three years post-close, as well as synergies of more than $60mm in the first full year and of more than $125mm during the second year post-close. The cost saving opportunities could offer CommScope a substantial boost in the 5G race as well as the opportunity to strengthen other product lines and reinforce the firm’s financial profile. Indeed, according to the firm, the transaction is expected to be around 30% accretive to the firm’s adjusted earnings per share by the end of the first year after the closing. Moreover, the operation permits CommScope to strengthen its credit position and financial flexibility. To begin with, due to complementary assets and skills that enable end-to-end communications services, the firm expects to generate $1bn in cash flow from operations in the first year whereas last year both companies combined $911mm. Additionally, given the increased scale, cash flow generation and the companies’ record of successful integration, CommScope expects to quickly de-lever from a net leverage ratio of 5.1x to 4.0x in the second full year after closing and, eventually, a long-term ratio between 2.0x and 3.0x. The market believed that CommScope was overleveraging its balance sheet for the acquisition of ARRIS, putting an additional $6.3bn debt over a combined cash flow from operation of slightly less than $1bn, but on a company with declining figures and that will require strong capex to stay relevant. Indeed, the deal was not welcomed by investors as CommScope’s shares plummeted from $24.49 to $19.36 (21% drop) on the day of the announcement. With the result that the firm lost more than a fifth of its market value after the US network infrastructure provider company said it had agreed to acquire its rival ARRIS for $7.4bn. It was the largest intraday drop in more than seven months. ARRIS, on the other hand, rose as high as 11% from $27.79 per share to $30.90 on the news, following the valuation implied in the acquisition. Allen & Company LLC, Deutsche Bank, J.P. Morgan, and BofA Merrill Lynch are serving as financial advisors to CommScope, whereas Evercore is providing financial advice to ARRIS.